New Nuclear Arms Reduction Treaty to enhance Effectiveness of US-NATO Global "Anti-missile Shield"
Currently, official discussions are progressing that relate to the drafting of a new Strategic Arms Reduction Treaty (START) to replace the former treaty which expired on December 5. Despite the seemingly promising development of a nuclear arms reduction treaty between the U.S. and Russia, it is worth noting that U.S. efforts to secure a nuclear arms reduction treaty will also substantially enhance the effectiveness of the new globally deployed anti-missile systems (SM-3, PAC-3). It is unlikely that any nation would launch a nuclear first strike to remove a strategic opponent absent of an existing military conflict. There is however the possibility of a relatively small conflict triggering a far larger confrontation (due to treaty obligations), which is considered by many analysts as being the most probable situation eventuating in a nuclear exchange. An anti-satellite/anti-missile system can intercept surviving nuclear missiles used to retaliate after a first strike (pre-emptive attack), therefore enhancing the strategic phenomenon of nuclear primacy. This threatening situation can be used to coerce compliance (subjugate) other nations. No nation would willingly accept such a situation or be subject to the existential threat created by the nuclear primacy capabilities of another nation. Various Russian advisors and strategists are aware of this situation as they have publically published their concerns. Recent changes to Russia’s nuclear weapon policy (from only retaliatory to the possibility of a pre-emptive attack option) also reflect recognition of developing U.S. strategic actions. It is interesting that the U.S. publically rejects notions of spheres of influence while in fact expanding its military globally and engaging in foreign political engineering. It is important to recognise that U.S. policies of pursuing ‘Full Spectrum Dominance’ and ‘Nuclear Primacy’ are inconsistent with strategies of preserving global stability. These polices also imply a global sphere of influence. These types of threatening actions and strategies create existential threats to other nations and therefore naturally invite a response. Despite Russia’s legitimate concerns regarding the expansion of military blocks (NATO) and new missile system architecture (SM3, PAC3) around its borders, creating an existential threat to the nation through a published and stated U.S. doctrine of nuclear primacy, successive U.S. administrations arrogantly continue to pursue these dangerous and provocative polices. The phenomenon of global U.S./NATO military expansionism, planned global deployment of new missile systems and more dangerously the pursuit of nuclear primacy (the ability to launch a pre-emptive nuclear first strike and defeat any surviving retaliatory missiles), risks resulting in an unplanned global conflict . This has historical parallels with the practices of former empires that engaged in military expansionism. The outcome has been relatively consistent, being wars (including two world wars) between opposing military alliances. Empires change throughout history but their actions and objectives are relatively consistent. It is interesting to observe how man’s behaviour has changed relatively little over the last thousand years but his military technology certainly has. There are interesting parallels between the expansion of the Nazi German empire (leading to WW2) and the expansion of the current global empire, the United States. Just as Hilter’s ambitions of a greater empire through military expansionism invited a response, it is probable that the global military expansionism of the current empire (in conjunction with expanding military alliances and military architecture and objective of achieving Full Spectrum Dominance), will eventuate in war with other nations that it threatens. Understanding the advancements in military technology and recognising the how previous wars increased in their destructive capacity to eventually annihilate entire populations of cities, we should recognise how any resultant war in current times is likely to end. It is important to recognise the obligations of security treaties. These various treaties often require all members to engage to assist any member involved in a military conflict. It is unfortunate but probable that the U.S. strategic objective of establishing, maintaining and gradually enhancing a situation of uni-polarity (global strategic dominance) will eventually result in this expanding military alliance engaging in a conflict with a member of another military alliance. Treaty obligations almost ensure that even the smallest of conflicts could escalate into a far larger confrontation. This has grave implications for much of humanity, which would be subject to the consequences of any third global conflict. Unfortunately it seems that the desire of many to unconditionally support successive U.S. governments regardless of their actions or policies, is preventing much public criticism and independent analysis of probable outcomes. Would we support our friend even if he is engaged in dangerous or criminal activities or would we speak out? In the end, we should recognise and accept the role we played in the development of events. Will we say to our children that we tried to prevent these dangerous developments or do we say to them we supported these actions through our silence or active participation. We seem not to learn from mistakes of the past and continue to pursue objectives through military force instead of law enforcement methods. In the end it is obvious that either man eliminates war or war will eventually eliminate much of mankind. Today, for the first time in almost 50 years, the United States stands on the verge of attaining nuclear primacy. It will probably soon be possible for the United States to destroy the long-range nuclear arsenals of Russia or China with a first strike. This dramatic shift in the nuclear balance of power stems from a series of improvements in the United States’ nuclear systems, the precipitous decline of Russia’s arsenal, and the glacial pace of modernization of China’s nuclear forces. A striking and highly secret characteristic of the existing plans was that they called for essentially the same strategic response and targeting list for each of three quite distinct ways in which general war might come about. The first, and most likely in the judgment of the JCS, was a U.S. nuclear first strike as an escalation of conflict between U.S. and Soviet conventional forces, perhaps originating in conflict over Berlin or an uprising in East Europe. Second was U.S. pre-emption of an imminent Soviet nuclear attack on the U.S., or as I’d heard it described in the Pentagon, “striking second first.” Third—and least likely in the eyes of the JCS—was a retaliatory response to a successful Soviet surprise attack. The US missile shield must be understood in the context of its geo-strategic nuclear deployment. Far from being defensive, its ultimate purpose is to obtain such an unassailable advantage over any other nuclear power as to be able to threaten any would-be opponent with nuclear extinction if it were not to comply with the wishes of the US. 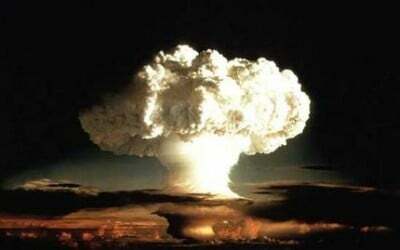 This new form of nuclear strategy has been called ‘compellence’. Attempts to expand the military infrastructure of NATO near the borders of our country are continuing. Russia will shift its policy on the “preventive” use of nuclear arms in the next version of its main military strategy document, a top Russian security official was quoted as saying on Thursday. “Changes in the positions on the option of carrying out preventive nuclear strikes will go into the new military doctrine,” said Nikolai Patrushev, the secretary of the national security council, Russian news agencies reported. It was not immediately clear whether Patrushev’s comments meant that Russia would expand the number of situations in which it would consider the first use of nuclear weapons. Under its current military doctrine, Russia says it would only carry out a nuclear strike if it were attacked with weapons of mass destruction or if it were the victim of “large-scale aggression” using conventional arms.